as sick as thirty years ago. It’s Salba day in The Badlands, California! Salba is one of the best pool rider ever and even if he confesses in “Grosso Letters To Skateboarding” that Malba (lil’ bro) was once better than him, Salba has ripped more pools than anyone. Salba will be at Pro-Tec Pool Party 2010 and has taped the deck to mark his hip lines & transfers with 'post-it' notes... Stepping on a skateboard for the 1st time in 3rd grade, Steve Alba evolved to bigger and better boards throughout the 70's. Salba is the pioneer of backyard pool skating and has become one of the most talented and most consistent pool rider to emerge during skateboardings vertical period. Long gone the rivalry between Alva (the Dogtown Mad Dog) and the Albas from Salbalands. Salba won the world’s first-ever pool contest—held at Spring Valley during the historic Hester Series—in 1978 and hasn’t stepped off his board since. 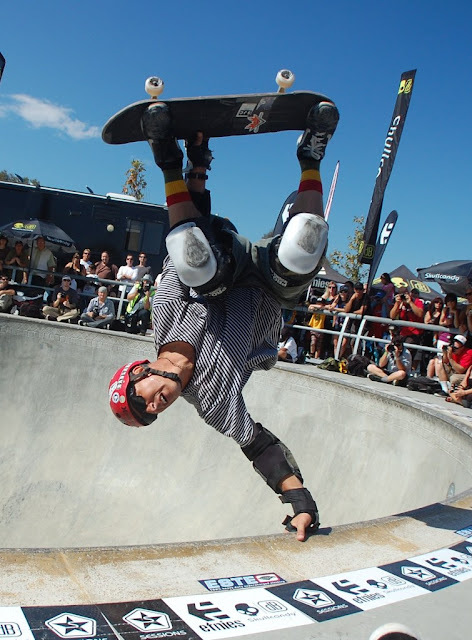 Having reportedly skated more backyard pools than anyone else alive, Salba has consistently placed in the top five at just about every contest he’s entered over the past 35 years he’s spent as a pro skateboarder, earning the nickname “Le Machine” as a result. In between contests, Steve Alba focused on strength and endurance at places like the Central Pool, L-Pool, Baldy Pipe, and later the proving grounds of Pipeline skatepark in Upland—home to some of the finest vertical riders to have ever have skated such as Chris Miller and brother Micke Alba. In the late ’70s, alongside Steve Olson, Alba joined the Santa Cruz team and steered skateboarding away from the clean-cut, all-American sport it was turning into, instilling it with a raw counterculture, punk rock ethos instead—something that’s carried over to the spirit of skateboarding even today. Thirty three years ago, Salba was doing tricks that not only most of us still think were rad at the time but that are still considered today as sick as thirty years ago; even with current standards, technicality, prowess and material evolution. Actually, nobody doubts that the original Upland Combi-pool was way more difficult to skate than the current resurfaced Vans Combi-Pool. The guys in a relatively easier Combi pool are now doing the same tricks that Salba was doing in an uneven, difficult and very dangerous bowl thirty three years ago. That’s the essence of class. Never turning his back on skating, Alba still obsessively searches out new, untouched pools, and has left his indelible mark and influence on anyone who’s ever picked up a skateboard, whether they know it or not. This Wednesday, May 18 in Hollywood, California, TransWorld SKATEboarding is proud to announce Steve Alba as the recipient of this year’s Legend Award, an award that sets out to officially recognize, acknowledge, and honor those who have forever shifted the legacy of what it means to be a skateboarder.